Obama chides opponents for reducing health care reform to "politics"
WASHINGTON (CNN) -- President Obama said Wednesday he was unable to guarantee that health care reform won't change how Americans get medical treatment, but he said any changes would be necessary and positive. 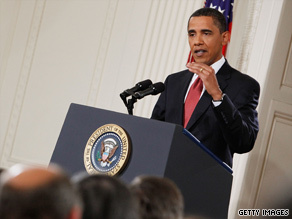 President Obama is urging Congress to move quickly to pass comprehensive health care reform. In a nationally televised news conference dominated by the health care issue, Obama delivered lengthy statements in response to Republican attacks on proposals he favors. He also attempted to ease the concerns of people left confused by the fierce debate in Washington. He repeatedly emphasized that the spiraling costs of the current system would bankrupt the nation while denying coverage to millions more Americans. Asked directly if he could guarantee that an overhauled health care system won't change how people receive treatment, Obama said no. "The government is already making some of these decisions," Obama said. "Insurance companies are making some of these decisions." The reform proposals he backs would have experts make decisions based on the best medical treatment, not accountants attempting to save money or doctors prescribing treatments that bring the highest fees, Obama said. Republican opponents of Democratic bills in the House and Senate said earlier that most Americans like the current system, which they said must be made less expensive and more accessible. Obama and Democratic leaders say the problems are deeper and systemic, and the president spent all of his seven-minute opening statement at the 52-minute news conference outlining the challenges and his proposed solutions. "Even as we rescue this economy from a full-blown crisis, we must rebuild it stronger than before -- and health insurance reform is central to that effort," Obama said. "If we do not control these costs, we will not be able to control our deficit. If we do not reform health care, your premiums and out-of-pocket costs will continue to skyrocket," he said. As he laid out the list of benefits that health care reform offers, he dropped a direct reference to a government-funded public health insurance option. Until now, Obama has consistently touted the government-funded public option as competition for private insurers in expanding access to health coverage. It was unclear if Obama changed the wording to avoid a label opposed by Republican supporters, or if he was signaling a policy shift toward a compromise being negotiated by the Senate Finance Committee to have health insurance cooperatives rather than a government-funded public option. Republican Sen. Charles Grassley of Iowa told CNN on Wednesday that the Finance Committee was not considering a public option. He noted that some insurance companies recently reported record profits, and said offering a competing government-funded health plan would require private insurers to offer less-expensive coverage. Speaking about the benefits of his plan, he said it would offer "security" and "stability" to sick and healthy Americans. "It will prevent insurance companies from dropping your coverage if you get too sick. It will give you the security of knowing that if you lose your job, move, or change your job, you will still be able to have coverage. It will limit the amount your insurance company can force you to pay for your medical costs out of your own pocket. And it will cover preventive care like check-ups and mammograms that save lives and money," he said. "Already, we have estimated that two-thirds of the cost of reform can be paid for by reallocating money that is simply being wasted in federal health care programs. This includes over $100 billion in unwarranted subsidies that go to insurance companies as part of Medicare -- subsidies that do nothing to improve care for our seniors," he said. Obama also chided opponents of his health care reform push for making the issue purely political. Will Obama's health care plan mirror 1994 Clinton failure? "I've heard that one Republican strategist told his party that even though they may want to compromise, it's better politics to 'go for the kill.' Another Republican senator said that defeating health reform is about 'breaking' me," he said. "Let me be clear: This isn't about me," Obama said, noting that he and every member of Congress -- including those trying to scuttle health care reform legislation -- "have great health insurance." Instead, he said, the debate is about people lacking health insurance because they can't afford rising costs, get denied due to a pre-existing condition, or lose their jobs. "This debate is not a game for these Americans, and they cannot afford to wait for reform any longer," Obama said. He also confirmed an agreement with fiscally conservative Democrats to create an independent group of doctors and medical experts empowered to eliminate waste and inefficiency in Medicare. Obama said he backed adding such a panel to health care reform legislation. Such a panel could both save money and "ensure the long-term financial health of Medicare," Obama said. So-called "Blue Dog" Democrats questioning the costs of initial health care bills said Obama gave a "verbal agreement" Tuesday to including the independent panel in health care reform legislation. Earlier Wednesday, Obama worked the phones, urging lawmakers to embrace health care reform, White House Communications Director Anita Dunn said Wednesday. It follows the president's Tuesday meeting with Democrats at the White House, dubbed a "serious working session" where "major progress" was made, Dunn said. Officials said Obama will be taking a more hands-on approach with members of Congress in the days and weeks to come regarding the health care debate. White House aides say the administration is concerned about three centers of serious opposition from House Democrats: the fiscally conservative Blue Dog Democrats who are worried about the cost of a public health care plan; the freshmen and other Democrats from high-income districts who are concerned about taxes for high-income Democrats, and the anti-abortion Democrats who are concerned about federal funding going for abortion services, and whether health care providers can opt out of certain procedures. One official said the administration is aware that "if any of these three groups abandon the effort the bill would be impossible to get out of committee, much less pass." Aides say the president and lawmakers also discussed the public option versus a co-op option. CNN's Suzanne Malveaux contributed to this report.